The sad fact is that if you are after a cheap holiday abroad then your options are slim. I found myself becoming frustrated at the fact that it is nigh-on impossible to find cheap flights direct from Scotland. Now, I know our good old Edinburgh and Glasgow airports aren’t exactly Heathrow, but they’re not small, or quiet either. I don’t know about you, but I am not a fan of the package beachholiday for two weeks on some overcrowded beach in Spain or Greece. This further limits my options for finding a cheap holiday. Maybe I’m just not looking in the right places, but this frustration has led me to explore the options for a holiday at home. Some, like myself, may have another half that for some reason thinks sleeping in a tent in a field is fun. Nothing, I repeat NOTHING is fun about that. At a bare minimum I need a shower and a loo, and a kettle to make tea! So in an endeavour to find a compromise I came across wigwams. These are cute little heated wooden eco-cabins that have a sleeping platform for your sleeping bags (some provide sheets etc) that folds away to give you more space. If you log on to www.wigwamholidays.com you can search for a site all over the UK and ones in Scotland include Crainlarich and even Wester Ross and Wick. These are a great alternative to tents and give you a little more security. While the sites have shower and toilet blocks and communal kitchens for everyone to use, I was looking for something a little more self-contained. What I was most interested in were the small lodges that the sites also have. These are basically a little bit bigger than the wigwams in order to accommodate a toilet, shower and a kitchen. They look like lovely wooden Wendy houses and are still Spartan enough for those who enjoy living in the wild. I really like the look of these and cannot wait to try one out. I think they are the perfect compromise between someone who likes camping and someone who doesn’t. Some sites even have yurts based on the traditional Mongolian home. These are fully insulated so you will still be nice and toasty; in addition they have a wood-burning stove too. They are decorated in bright colours that you would expect from a traditional yurt. If you are looking for something a bit different then these are an awesome way to spend your holiday. As far as prices go, for three nights in July for two people, a small wigwam costs around £90 and a large one around £100. A small lodge is around £180 and a yurt around £180. So between two people it is very reasonable and means your money will go a lot further. Another, more unusual option is a roulotte. A roulotte is a traditional caravan that we would associate with gypsies. Roulotte Retreat is a site situated in a meadow in the Border. You can have a proper look on their website www.roulotteretreat.com. There are seven hand-crafted roulottes from France and Holland all decorated differently in a traditional but quirky style. All roulottes have a shower, toilet and kitchen. The result is a cosy wee caravan, perfect for spending a few days in the summer. The prices start from £90 per night to £135 per night. 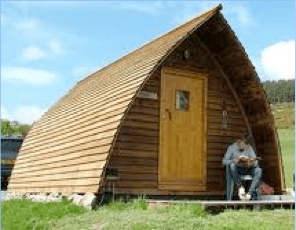 So they are more expensive than the wigwams and lodges but look like they would definitely be worth it and I hope that I get to try one out! There are definitely fun and interesting ways to spend your summer without leaving Scotland. I’m all for travelling the world but if all you are looking for is a cheap and easy break for some time away then I would definitely take a look at one of these. And as for camping, well you know where you can shove your tent.